UC Santa Cruz students, faculty, and staff are invited to join in a gathering to support the diverse perspectives and needs of our community. The event will run from 4 to 6 p.m. on Wednesday, Nov. 16, at Quarry Plaza. This special gathering will include reflections from campus leaders, and campus community members are invited to offer their own refections through an interactive art project. For more information, or to request accommodations, please contact deanofstudents@ucsc.edu. UC Santa Cruz is offering several opportunities for students to gather and discuss the election results. The Dean of Students and Slug Support is offering drop-in space from 9 a.m. to 5 p.m. today at the Hahn Student Services building. The drop-in will continue Monday through Friday. Friday, November 11, 1 p.m., community gathering on the Merrill Lawn. Opening gathering space in Communications Building, Room 139, from 9 a.m. to 6 p.m. on Thursday, Nov 10, and Nov. 14 to Nov. 18 except for when classes are held. The Ethnic Resource Center, on the third floor of the Bay Tree Building at Quarry Plaza, is offering drop-in space from 10 a.m. to 4 p.m. today. Students can visit the Diversity and Inclusion Office from noon to 5 p.m. today at the Stevenson Academic Building, Room 116 for chat and meditation. Kresge College and the Kresge Multicultural Education Committee is providing a space for students to discuss their feelings, reactions, and experiences of the election outcome. The event will begin at 7 p.m. tonight at the Kresge Student Lounge (161) and surrounding Piazetta area. Oakes College's Solidarity Tongue event will be at 8 p.m. tonight at the Oakes Learning Center. The campus also offers regular meditation sessions for the community on Mondays, Wednesdays, and Fridays. History of the Black Lives Matter movement at 7:45 p.m. at Stevenson Apartment Community Room. Cowell College drop-in support at 5 p.m. at Cowell Fireside Lounge. Stevenson College drop-in support at 5 p.m. at Stevenson Fireside Lounge. Colleges Nine and Ten community gathering at the Namaste Lounge at 9:30 p.m.
Counseling and Psychological Services is available to support students in need. The Employee Assistance Program is available to support faculty and staff. The Dean of Students Office has free speech resources online with information for students about exercising their First Amendment rights. Students can report possible rules violations to the Student Conduct and Community Standards Office through the Public Reporting Form, or to residence hall staff such as CRE's or RA/NA's. 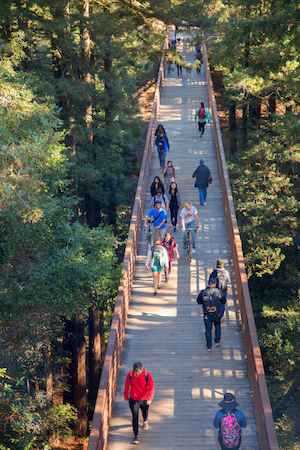 Incidents of hate or bias may be reported at reporthate.ucsc.edu or through an online form. Campus community members are encouraged to call police at 911 or 459-2231, ext. 1 if they need to report any suspicious or concerning behavior.